While arguing for a firm position on European values, increased European defense cooperation and reinvestment in security, she emphasized that we are facing increasingly urgent and serious security threats, which will affect the prospects for global justice. This lecture took place as part of the Institute’s Distinguished Speaker Series, which provides a stage for prominent experts and practitioners in international affairs to discuss topics related to global governance, the rule of law and conflict prevention. Welcoming remarks were made by Dr. Abi Williams, the President of The Hague Institute, who emphasized the timeliness of this lecture as Europe faces a combination of threats. He underlined the challenges faced by Minister Hennis, particularly as regards the critical choices she must make on spending and strategy. The Minister of Defense began her speech by establishing that “we are living in an era of momentous change”, a fact that challenges the notion and implementation of global justice. She substantiated this argument by mentioning the conflict in Ukraine, the civil wars in the Middle East and North Africa and the expansionist efforts of China in the South China Sea. Building on the book The Breaking of Nations by Robert Cooper, Mrs. Hennis-Plasschaert talked about the existence of three zones in the world: the premodern, modern and postmodern worlds. She argued that the postmodern world of European states is not only threatened by the premodern world, which is evident from the unravelling of some Arab states, but also by the modern world. Russia and China represent the modern world; they continue to increase their military spending and they are not afraid to use their military power in the pursuit of geopolitical interests. Europe will have to become more modern in its worldview, Mrs. Hennis-Plasschaert argued, if we are to cope with the increasingly complex global order that derives from multipolarity and increased global interconnectivity. 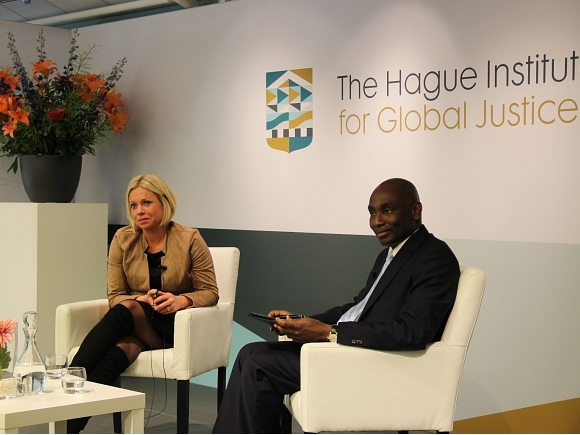 Mrs. Hennis-Plasschaert went on to say that Europe must take initiative in this increasingly complex world. She argued that European states should strengthen both the transatlantic partnership and cooperation within the continent, as well as invest more in security in order to rebuild military strength. She also emphasized that Europe needs to fight for its values and ideals, and not comply with the laws of the jungle. Threats are becoming more urgent, Mrs. Hennis-Plasschaert argued, while she mentioned terrorism, sectarian violence, digital espionage, refugee flows and international crime as some of these threats. The essence of her argument was that “if we are not prepared for danger, we risk losing the peace and growing prosperity that together have brought so much good to the world”. During the Q&A session, various issues were raised, including migration flows from North Africa, the Netherlands’ contribution to UN peacekeeping, the broken trust between Europe and Russia, the civil war in Syria and Iraq, and the threat of cybercrime. This gave Mrs. Hennis-Plasschaert a chance to stress the need for a comprehensive European approach to these issues, which includes development, defense and diplomatic efforts.